Computer engineer William English helped develop the collaborative oN-Line System or NLS in the late 1960s. Photo courtesy of the Computer History Museum. On Dec. 9, 1968, seven months before men landed on the moon, the roar of a mouse from Menlo Park reverberated around the world. Seated onstage before a meeting of the Joint Computer Conference in San Francisco, with a large video screen projecting his face and the images on his computer, Stanford Research Institute engineer-inventor Douglas Engelbart unveiled the mouse that scrolled. During a 100-minute presentation in which he used his wife's shopping list, he demonstrated word processing and editing, showed the possibilities of hypertext and even held a video conference with his lab at SRI. "Come in, Menlo Park," Engelbart intoned, and the SRI engineers joined in, their faces and notations filling the screen in San Francisco. The audience of 1,000 techies rose to their feet in a spontaneous standing ovation. Decades before the Internet and Skype transformed the global landscape, SRI had achieved what Engelbart called "a monstrous goal." Dubbed "the mother of all demos," the event spurred a technological revolution that transformed the very nature of communication. Bowled over by black-and-white footage of the 1968 event, contemporary composer-performers Ben Neill and Mikel Rouse have constructed a demo of their own: a multimedia electronic opera based on the work of Engelbart, who died in 2013 at age 88. Aptly titled "The Demo," the opera will have its world premiere next Wednesday, April 1, at Stanford's Bing Concert Hall. "The Demo" is also the first event of a new Stanford Live series called "Live Context: Art and Ideas," which also includes lectures, classes and panel discussions, two of them on April 2 and 3 at Bing. The 90-minute performance incorporates original film, electronic music, computer-generated art and vocals. Both composers also perform, with Rouse taking the role of Engelbart and Neill playing Bill English, Engelbart's SRI colleague who actually built the first mouse. Rouse, who also sings, wrote the libretto, using phrases from Engelbart's demo as opera supertitles, among them 2C ORANGES, 2D APPLES, 3 NEWS, 4 LETTUCE, 5 FRENCH BREAD, 6 BEAN SOUP. "Singers' entrances happen as the text comes on screen," explained Rouse in a recent phone interview. "When the text comes up and you hear it sung, it looks like magic. You can't figure out how they're doing this live." Rhythmic chants bring to mind avant-garde rock opera, or, perhaps, Carl Orff's "Carmina Burana." But Neill and Rouse take their production to another plane, augmented by computer graphics and voice processing, along with a live chorus and Neill's "mutantrumpet": a three-bell electro-acoustic instrument he invented. Before creating "The Demo," the two composers, both 57 and living in the New York City area, had collaborated on a number of programs, but neither was familiar with the 1968 computer technology breakthrough. Neill came upon a video of Engelbart's demo on the Stanford website while researching the history of the Internet for a class at New Jersey's Ramapo College, where he is an associate professor of music industry and production. "I was completely blown away," he said. "I was just so taken not only by the content but also by the quality of the video. I found it remarkable that so much of the technology we use in our daily lives could be traced to this one event, which was essentially a type of performance." Planning to use Engelbart's demo as a teaching tool, he also thought about "trying to make some kind of artistic work around this because I didn't think very many people knew about it. It was such a remarkable document about an event that changed the world." Plus, "there was something about Engelbart's personality and the way he seemed to be delivering this thing" that inspired Neill. "He was so calm and relaxed, almost meditative," the composer explained. "Using technology in live performance in 2015, I know it can be harrowing. He just seemed to be so relaxed, as if he had done it a thousand times." Neill and Rouse were struck not only by Engelbart's vision but also by the work of English, who now lives in Novato with his wife Roberta, Engelbart's former secretary. The Englishes met with the composers during the course of the project. "They have been hugely wonderful supporters," Rouse said. The Englishes explained how the original demo came together, laying the groundwork for cellular communication, albeit the hard way (see sidebar). "I didn't realize they ran 40 miles of cable to San Francisco's Civic Center to accomplish this," said Rouse. "They were emulating Skype and Google chat, but we didn't have the Internet." Like many who came of age with computer technology, Rouse said, "We never questioned where it came from." Although Engelbart had no rehearsals for his demo, "We didn't have that luxury," Rouse said. He and Neill began developing their work in 2012. It was commissioned and developed at Krannert Center for the Performing Arts in association with the eDREAM Institute at University of Illinois, Urbana-Champaign. In early 2013, the composers were in residence at the university, working on the first draft of the score and exploring performance technology with the National Center for Supercomputing Applications. They returned to the campus earlier this year for rehearsals and a workshop premiere. But holding the opera's world premiere at Stanford "couldn't be more perfect," Neill said. Rouse agrees. He hopes that the show will get "a lot of young techies really excited," attracting an audience that might not ordinary attend an operatic performance with supertitles. After all, there's nothing stodgy about "The Demo," which utilizes music from late '60s rock to '70s jazz fusion to pulsating electronic rhythms, incorporating styles from the period when the original demo was made, as well as those from today. "Ben and I also work in the vernacular," Rouse said, explaining that "The Demo"'s music has "a very definitive EDM (electronic dance music) quality. The sound will be familiar to young listeners." Both Neill and Rouse are classically trained composers and musicians. Rouse, who also has formal training in visual arts and filmmaking, is both a singer and an actor. When he first began working in multimedia, "I cast myself because I couldn't afford real actors," he said. "After over 20 years, I got good at it." In addition to composing and playing the mutantrumpet, Neill is a sound and installation artist. He booked Rouse's first two operas at The Kitchen, an experimental performance space in New York where he was music curator, and worked with him on a 1994 album. When Neill discovered Engelbart's demo, he said, "I immediately thought of (Rouse)." "The Demo" will give younger audiences "a glimpse into the world back in 1968," Rouse said, adding that the combination of technology and live performance should have broad appeal in Silicon Valley. "People long for human connection," he said. "Bringing this technology into a performance arena" offers an experience "you can't get from social media." Drawing people together through opera: That, as Engelbart himself might have said, is "a monstrous goal" indeed. When: Wednesday, April 1, and Thursday, April 2, 7:30 p.m.
Info: Go to live.stanford.edu or call 650-724-2464. 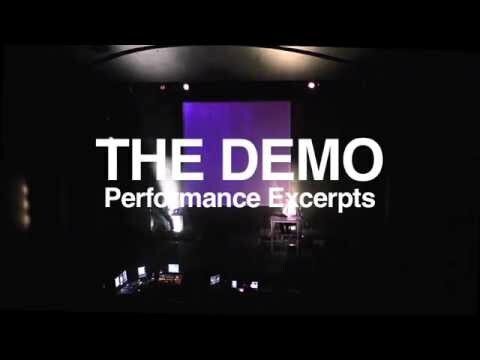 When the "mother of all demos" began to play before a San Francisco audience, Bill English was at his computer in Menlo Park, awaiting a videoconference call from his boss before going onscreen himself. As chief engineer at Douglas Engelbart's Augmented Human Intellect Research Center" at SRI, he implemented Engelbart's vision, building the first wooden prototype of the mouse in 1963. In San Francisco, it was showtime. Roberta English, then Carillon, was at Civic Auditorium, assisting Engelbart. Instead of standing up and delivering a dry technical paper, he sat onstage before his computer, a large screen behind him magnifying his work. The mouse Bill English built was in Engelbart's right hand, pointing to elements on the screen. It "was a box set on a table with a wire on the back, a device with a tail," Bill English said during a phone interview from his home in Novato. "We called it a mouse. We needed a simple name." It may have been simple, but it nonetheless fired the computer revolution. Afterward"all these people stood up like it had been a rock concert," Roberta said. "They just didn't stop clapping ." "It was not possible to do a rehearsal, clearly," said Bill. "It unfolded as we talked." In fact, "it wasn't until the entire audience stood up and applauded that we realized what we had done." Bill, 86, and Roberta, 78, who married in 1970, lived for years in Menlo Park and later Portola Valley before retiring to Novato. When they got a call from the Computer History Museum that Ben Neill was in Mountain View and wanted to use some of English's technology, they hopped into the car and rushed to the museum to meet him. Discovering that Neill and Mikel Rouse were developing a theater piece based on Engelbart's 1968 demo, they eagerly pitched in. Bill loaned them a "keyset" developed in Engelbart's lab for typing and entering commands with the left hand while "mousing" with the right hand. The composers had the keyset duplicated and will use it in the show, much as Engelbart had during the original demo. He and Roberta also filled the composers in on the logistics of the 1968 videoconference. Setting it up was a herculean task, according to Bill. The team found a line of sight between the Civic Auditorium and SRI on Skyline Boulevard, stationing two large trucks with cameras. With assistance from Pacific Bell, one of the trucks picked up signals from Menlo Park, the other from San Francisco, transmitting signals back and forth. "It was a marvelous hookup," Bill said. "That's what made it work." Meanwhile, they borrowed a video projector from NASA Ames Research Center in Mountain View and also found an arc light. Some of the funding for the project came from the Air Force and the research arm of the Defense Department. Stewart Brand, founder of the Whole Earth Network, was also involved. Said Bill: "Well, we didn't expect (the demonstration) to get the reputation it did. But it came off as planned. It took a lot of planning." Roberta, who was technically Engelbart's secretary, "but didn't have a lot of traditional secretarial work to do," assisted in myriad ways. "It was just wonderful to find myself in Doug's group," she said, describing it as a small staff of about 17, with no outside help. Engelbart, a visionary, called his modus operandi "bootstrapping," which he defined as increasing a organization's "collective IQ" by implementing new tools and practices. She also sees Neill and Rouse as visionaries, and meeting them "has been a delight for both of us," she said. "I was very impressed with these guys. "This is going to be a special thing for us, but I'm hoping it captures the audiencesthat it connects with both [the composers' own vision and brings the demo back into focus for people after all these years."